Elite SL3000UL8DM Dual Motor Slide Gate Opener Discounts Apply ! The Elite SL3000UL8DM Commercial Slide Gate Opener (also known as a Elite slide gate operator or Elite slide gate motor) is a heavy duty slide gate opener that uses a unique, patented dual (1/2 HP) motor feature. Because of this feature, this operator can work in high ambient temperature conditions. Handles continuous cycles daily and gates up to 800 lbs. and 37 ft. in length. Includes pre-installed Liftmaster receiver. Choose Elite gate operators for superior reliability and performance. The SL3000UL8DM slide gate opener uses a unique, patented, dual motor feature. One motor opens the gate and the other one closes it, unlike any other operator in the world. Because of this feature the operator can function in less than ideal conditions, such as desert environments, and not overheat the motors. It is capable of continuous cycles on gates up to 37' and 800 lbs. The SL3000UL8DM is specified for use at heavily accessed high traffic areas such as multiple family communities with 250 or more homes in high ambient temperature applications. 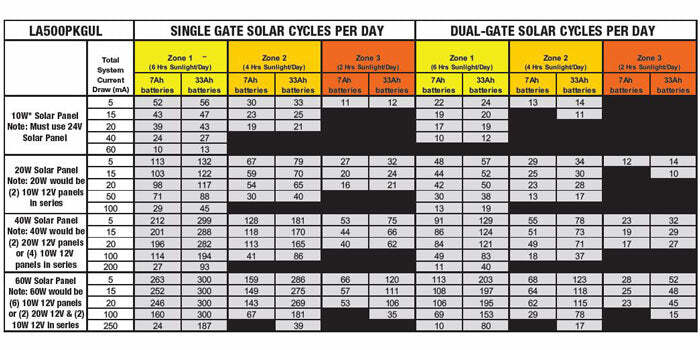 This line of Elite Gate Operators comes with a 7-Year Residential Warranty or 5 Year Commercial Warranty. 4X12 Saw Cut Style Loop With 20' Lead. Features a non spliced, continuous wire throughout loop turns and lead-in. Elite SL3000UL8 1HP slide gate opener (also known as a Elite slide gate operator or Elite slide gate motor) is a heavy duty slide gate opener with a 1 HP motor. The SL3000UL8 1HP can handle 35 cycles per hour and gates up to 2000 lbs. and 37 ft. in length. This is one of our most commonly ordered products. Select the Elite SL3000 gate operator for the best reliability and quality, these types of gates are used for high traffic environments and developed for the best performance.